Happy Friday to everyone, and welcome into another outstanding edition of the Daily Noontime! Let’s jumpstart the final workday with some headlines and news from the city of Boston! * The Boston Celtics will resume their first round NBA playoff series on Friday, as they welcome the Atlanta Hawks to the TD Garden for Game No. 3. * Rajon Rondo, who served a one-game suspension during Game No. 2, will return to the lineup. Ray Allen, who hasn’t played since the regular season, is optimistic about playing Friday, while head coach Doc Rivers hopes that Mickael Pietrus will be able to record his first playoff bucket in a Boston uniform. * The Boston Red Sox will attempt to snap their two-game skid at Fenway Park on Friday when they welcome the Baltimore Orioles to Fenway Park for a 7:10pm first pitch – Jon Lester opposes Wei-Yin Chen. * According to various reports on Thursday – Boston Bruins team president Cam Neely told the media that he thinks the team’s first round playoff loss to Washington should motivate them for future success. * Finally, the New England Patriots recently re-signed defensive lineman Gerard Warren and released wide receiver Tiquan Underwood. Ah… it’s Thursday, which means we’re one day closer to the end of the work week. However, this is a rather solemn day, as Bostonians mourn the loss of the Boston Bruins, so let’s try to brighten the mood with headlines and news! * As stated above, the Boston Bruins quest toward a seventh Stanley Cup championship ended on Wednesday evening at the TD Garden when the Washington Capitals defeated them, 2-1 in overtime. Joel Ward scored the clincher at 2:57 in the extra session, which punched the Capitals ticket to the second round of the Eastern Conference playoffs. * After the seventh game concluded – James Murphy of ESPNBoston provided a ‘to-do‘ list of things the Bruins need to focus on during the offseason. Also, ESPN’s Barry Melrose provided his ‘two-cents‘ on the Caps 22-year-old goaltender Braden Holtby. * The Boston Red Sox earned their first regular season series sweep of the season on Wednesday, as they defeated the Minnesota Twins, 7-6. Clay Buchholz earned second win of the season, while Alfredo Aceves registered his fourth save. As for the Sox offense, Mike Aviles his his fourth home run of the season, while Dustin Pedroia recorded a double and triple. * The Sox will look to extend their three-game winning streak on Thursday when they travel to Chicago to face the White Sox at 8:10pm —Felix Doubront opposes Philip Humber. * Finally, the Boston Celtics will conclude their 66-game regular season slate on Thursday when they welcome the Milwaukee Bucks to the TD Garden for an 8PM tip-off. There’ll be a new Eastern Conference and Stanley Cup champion this year, as the Washington Capitals defeated the Boston Bruins in Game No. 7 at the TD Garden on Wednesday, 2-1 in overtime. How the game was won: Washington’s Joel Ward recorded his first playoff goal at 2:57 in the extra session, which lifted the Capitals past the Bruins. Washington will advance to the semi-finals for the second consecutive year in a row. They’ll most likely face New York, but that could change pending an Ottawa victory on Thursday. No Home Cooking for Boston: Entering the seventh game of the Eastern Conference quarterfinals, Boston believed their crowd would provide the necessary assistance. However, after a rather lackluster and up and down first frame, the noise and excitement disappeared, but returned once Tyler Seguin slid past Braden Holtby for the Bruins only strike of the contest at 14:27 in the second period. In the third period, Boston’s crowd attempted to play the role of ‘the sixth man’ with various chants, but the Bruins didn’t deliver. Boston’s Power Play: Once again, the Bruins power play was a major issue. In the third period, Boston had a golden opportunity when Washington’s Jason Chimera was sent to the penalty box for holding at 17:34, but the Bruins failed to capitalize on their third power play of the contest. Boston concluded their first round series with Washington going 2-for-23 on the power play. 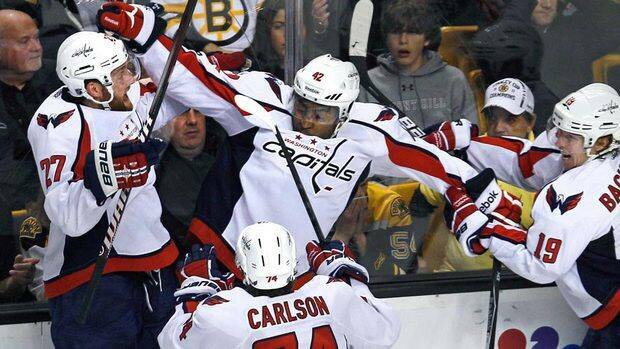 Boston-Washington Make History: Boston and Washington set an NHL record with seven games being decided by one point. They also experienced four games that needed at least one extra session to decide the outcome, too. Finally, if you’re a Boston Bruins fan who needs a pick-me-up, please click PLAY on the YouTube video we’ve provided below!